I generally know better than to leave wherever I am for the weekend before 6pm or so on a Sunday, but for some reason found myself heading back to Los Angeles yesterday with the masses around 4pm. Traffic was stopped bumper to bumper and there were signs warning drivers of “very heavy traffic due to construction”. Oh gooody! Just what I want to do, spend 6 hours driving back to LA on a Sunday. After checking my Waze app to see that traffic would be pretty insane all the way back, I quickly decided this was not going to be an acceptable end to another fabulous weekend in Las Vegas. So I threw caution to the wind and stopped at Whiskey Pete’s (opened in 1977) at the State Line town of Primm to pass the time and allow the hoardes to make their way back through to Cali. I was so happily surprised by how it all turned out! What a treat! 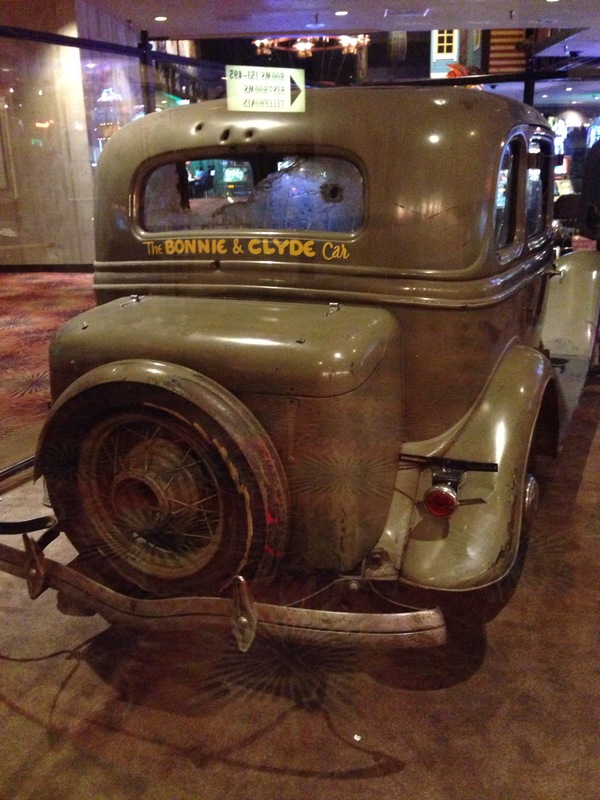 After receiving a tip from a like-minded fellow road tripper while I was buying a few postcards in the gift shop, I spent the next hour or so perusing the Bonnie & Clyde and mob exhibit in the casino. How have I not heard about this before? 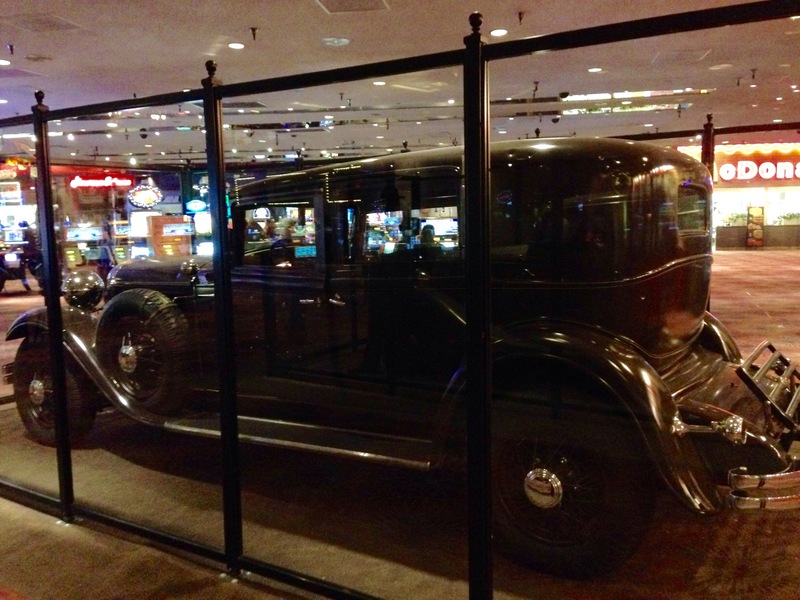 Two cars on display RIGHT IN THE CASINO. Mobster Dutch Shultz’s 1931 Lincoln that was later owned by Al Capone and his gang and THE “DEATH CAR” of THE infamous BONNIE AND CLYDE. 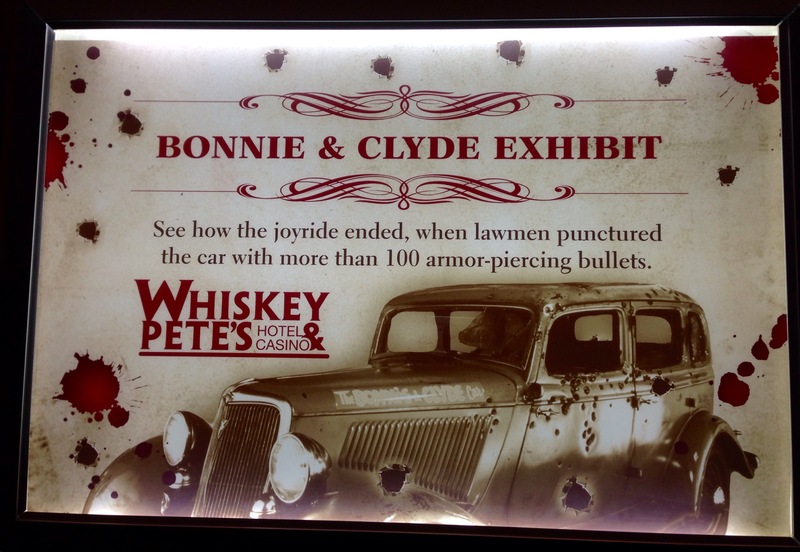 Bullet holes, blown out windows, the whole works, seemingly totally untouched, behind glass for all to admire right there in Whiskey Pete’s! 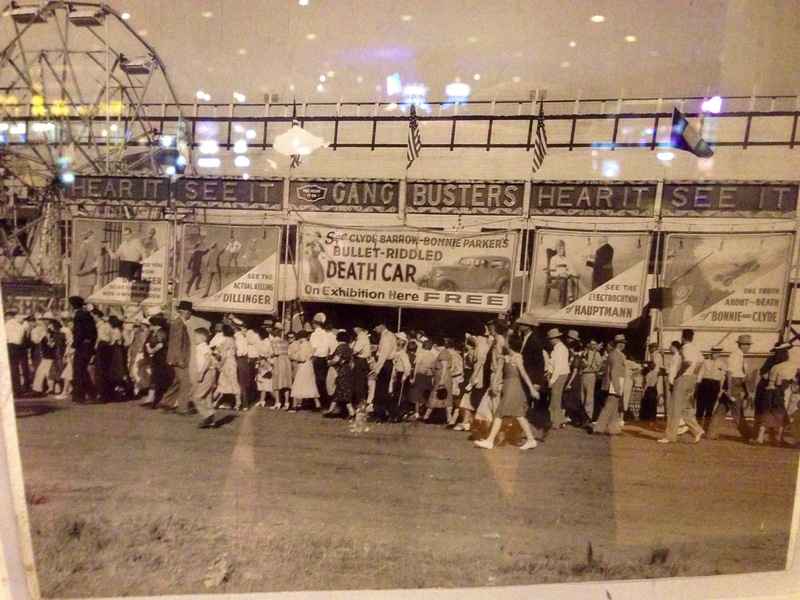 In addition to the cars were artifacts, news clippings, photographs and a very cool Las Vegas Mob time line along the back wall. 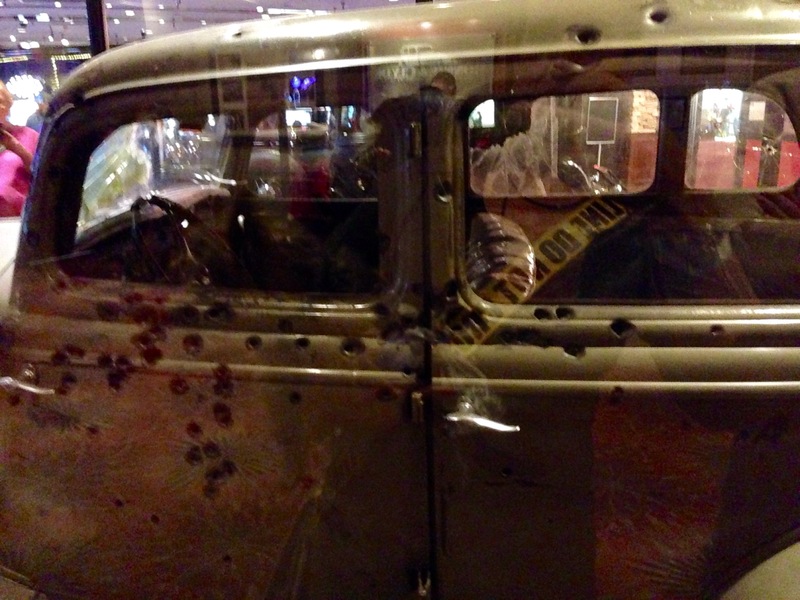 Mobster Dutch Shultz’ 1931 Lincoln, which was then owned by Al Capone and his gang. Check out the bullet-proof, lead-filled doors and inch thick glass on this puppy! 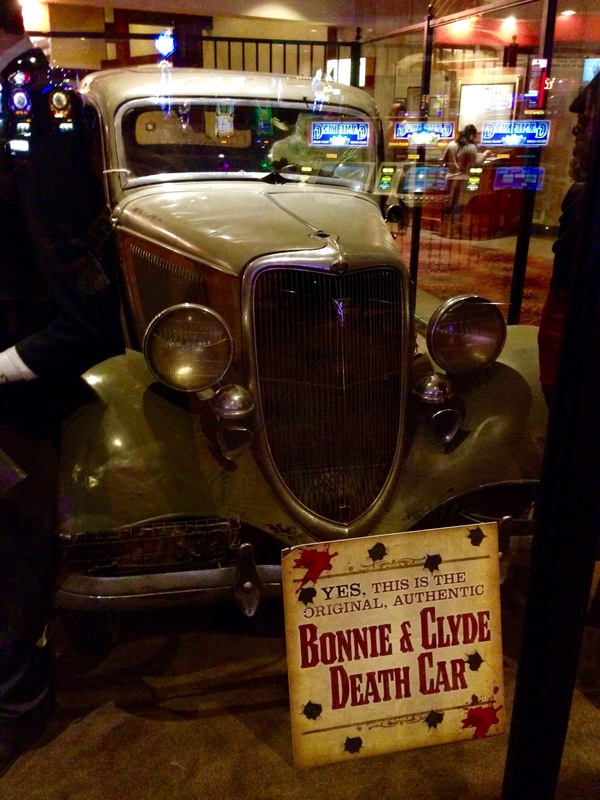 Bonnie and Clyde’s “DEATH CAR”. Check out the shattered glass and bullet holes. Ambushed and killed by Louisiana police on May 23, 1934. 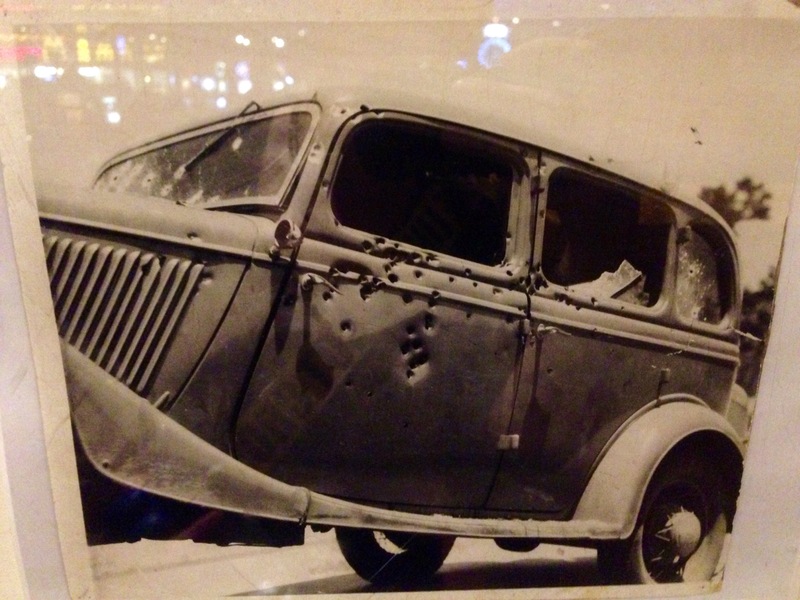 An original photo of Bonnie & Clyde’s DEATH CAR. 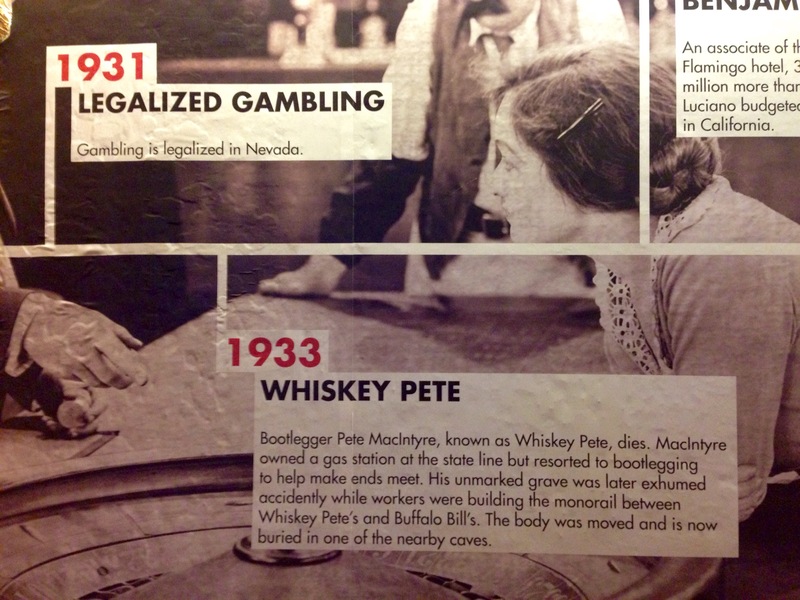 The casino’s namesake, Pete MacIntyre apparently owned a gas station on this land back in the 1920’s and struggling to make ends meet, resorted to…you guessed it, bootlegging. He died in 1933 and years later his body was found in an unmaraked grave as construction crews were building the bridge that connects Whiskey Pete’s to Buffalo Bill’s across the highway.Legend has it, his body was moved to a nearby cave where it is said he brewed his moonshine. INTERESTING! 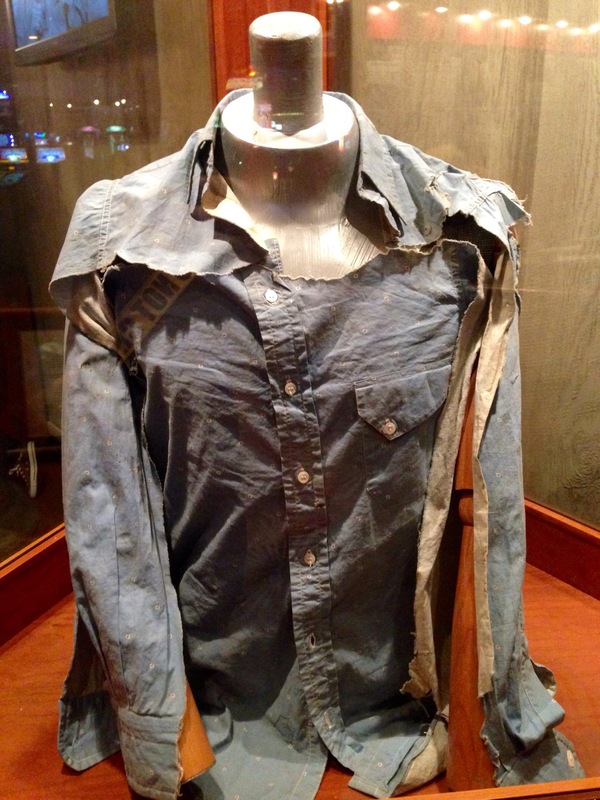 I was so impressed with this exhibit of Las Vegas/Mob history, but also in awe that these items are hidden away here at Whiskey Pete’s and many people may never get the chance to see them. They need to advertise! From what I learned, the exhibit has moved around the area somewhat and finally made its way back to Whiskey Pete’s as of summer 2011. 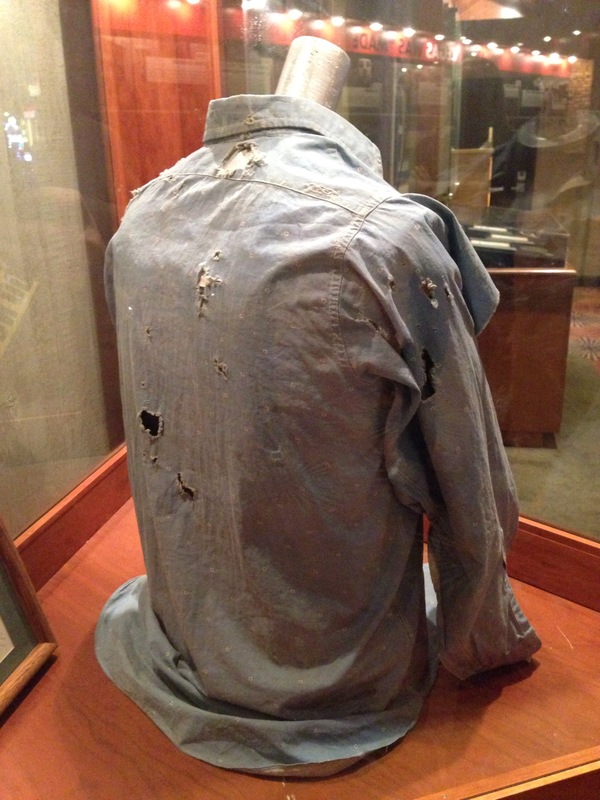 Certified as authentic, this is the shirt Clyde was wearing on the day Louisiana police shot and killed he and Bonnie in May 1934. 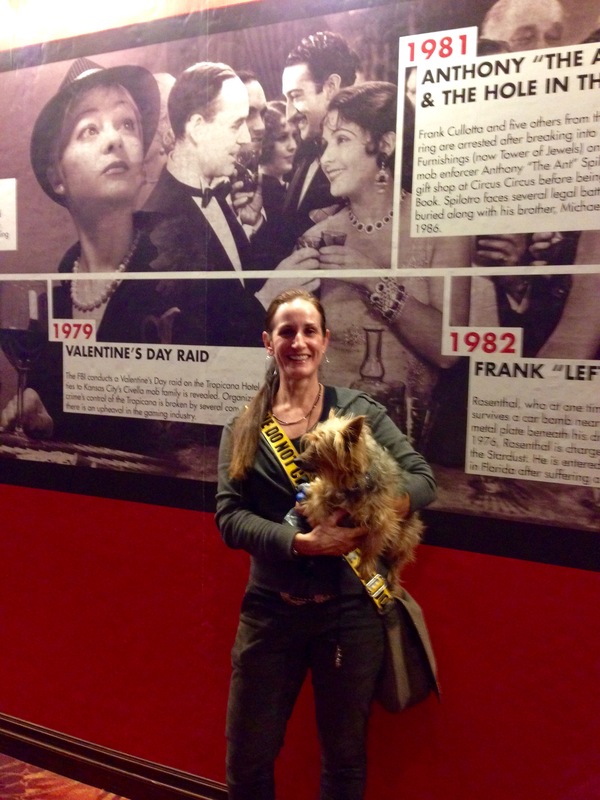 Generously donated by Clyde Barrow’s sister, Marie. One of history’s most notorius duo’s in love and crime. Bonnie Parker and Clyde Barrow. Only 23 and 25 years old respectivey at their time of death. Everyone should make a stop here on their way out of town for a look-see. Hey, you can fill up your gas tank, get a bite to eat at IHOP, McDonalds, Qdoba or Subway and play the slots in hopes of “gettin’ even before leavin!” as the sign out front says. Very low key casino with really friendly and helpful employees, like the blond German woman who we chatted with and suggested we take the tram and go check out Buffalo Bill’s while we were there. I spent a few minutes discussing the exhibits with two different and very cool truck drivers (one whose name was SALLY JANE!). I can’t speak to the hotel rooms themselves, but would I stop in again? MOST DEFINITELY! Thanks Whiskey Pete’s for making the end of my Vegas weekend so excellent! And just in case you’re still wondering if I made the right decision to stop, I cruised back to my pad in only 3 hours and 15 minutes after hanging out in Primm for a few fun-filled hours. Totally worth it! LADY LUCK was definitely on my side yesterday! HOW COOL, Sally. Love it! So cool. That gave me chills. Think your an inspiration for the rest of us Cows stuck in traffic griping and complaining. Go Sally! Hi Bruce, I agree. The cars are gems! 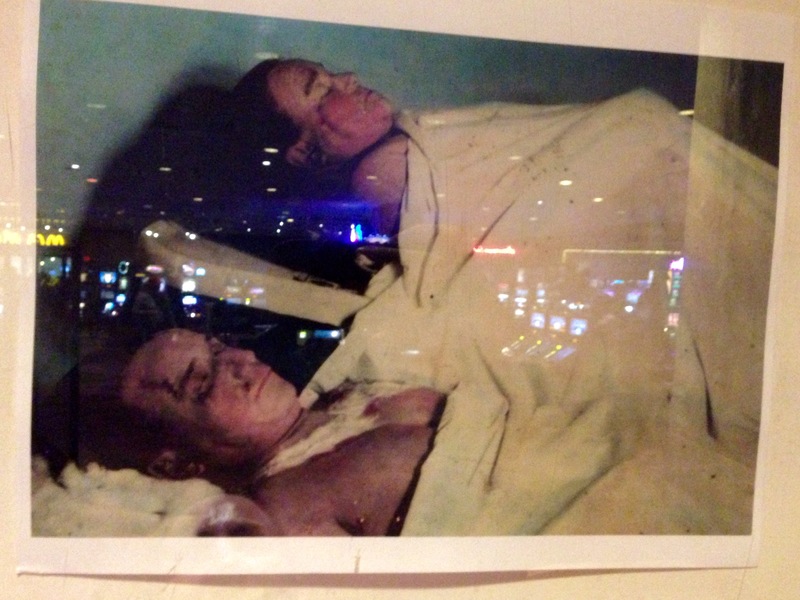 What fascinating history hiding inside Whiskey Pete’s. So glad you enjoyed it! Thanks for reading!